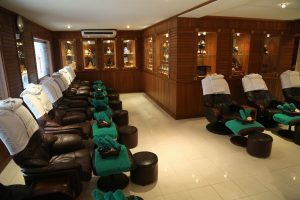 There are seemingly thousands of massage parlors and day spas in Bangkok ranging from the very cheap to the more luxurious. 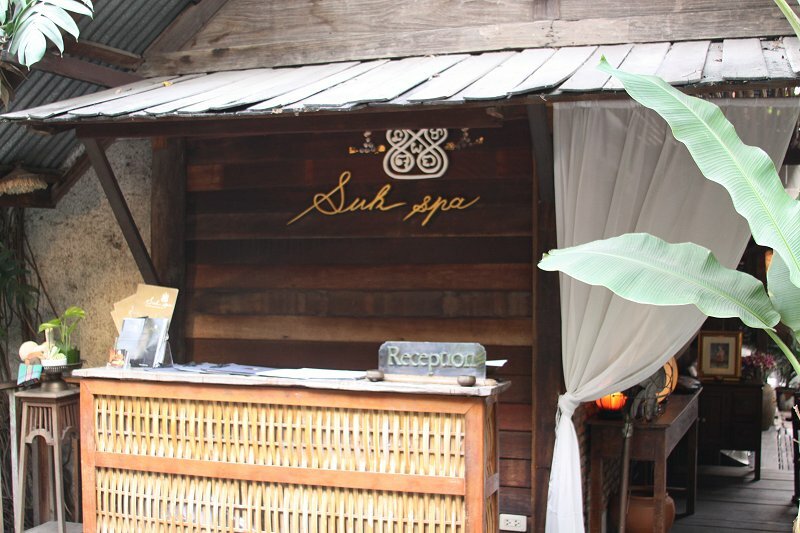 Districts such as Khao San Road are loaded with cheap massage options. 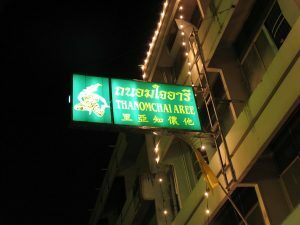 Parts of Sukhumvit also feature an extensive range of massage parlors. FOOT MASSAGE usually lasts from 30 to 120 minutes. Your feet are initially washed in warm water – it is a good idea to show up at the massage parlor wearing shorts instead of long pants as the foot massage covers not only your feet but your legs as well. If you have long pants on, the massage parlor will typically give you fisherman trousers to change into. The masseuses will use oil and sometimes wooden instruments for the harder massage work. These can be extremely relaxing and we have certainly fallen asleep numerous times during foot massages. Often after a foot massage the masseuse may have you sit up and will give you a head and shoulder massage. There are several things to look for when getting a foot massage. The masseuse needs to use enough oil so as not to cause chaffing on your legs (especially for men) and the oil should be removed after the massage with talcum powder and a towel. Small massage businesses often have rows of chairs lined up in a room next to the main entrance. Some will have curtains that can be drawn between the chairs to give some greater feel of privacy. Something to consider when looking for a foot massage is the proximity to a busy street and how much traffic noise you can hear inside the room. It is not pleasant trying to relax when all you hear is the loud noise of passing traffic outside. SWEDISH/OIL MASSAGE typically involves removing all of your clothes and lying down on a raised massage table or on a soft mat. You will lie under a small towel. The masseuse will slowly massage your body using their fingers, palms and elbows; your body will be incrementally covered in oil as the massage progresses. If you don’t want oil in your hair, tell your masseuse to wash their hands before massaging your scalp. These types of massages often take place upstairs from where the foot massages take place. 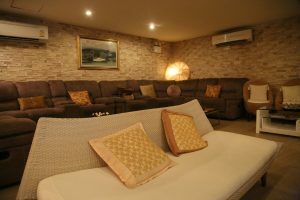 And are held in either private or semi private rooms depending on the business. Typically no stretching is involved in these types of massages. 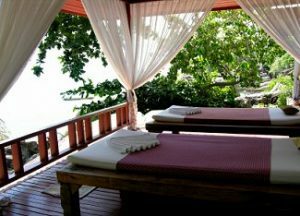 THAI MASSAGE Thai massage is where you remain fully clothed – typically fisherman trousers and a light weight button-on shirt are given – so that you can change from your street clothes. Your feet are usually washed in warm water before your massage. Your massage should be in a private curtained part of a room or in its own room. You lie on your back and stomach during parts of the massage and the masseuse will use their hands with mainly their thumbs to push and massage on pressure points. Thai massage also usually involves some minor stretching. A true Thai massage is a very strong massage – however many masseuses’ often give lighter massages for tourists. In any case you should indicate the level of desired strength to your masseuse prior to the massage and have them adjust accordingly if needed. 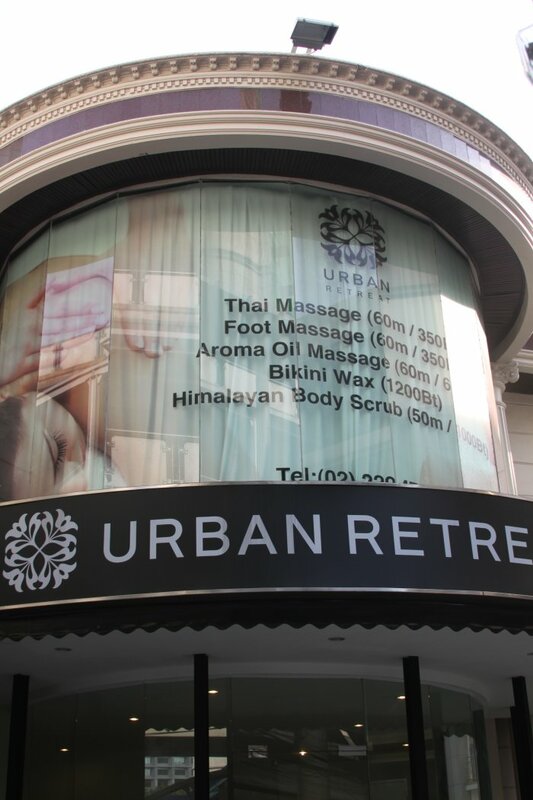 FEATURED SPA – *Urban Retreat Spa* operates several spa’s in Bangkok; their original location is on a quiet street off of Sukhumvit and due to demand two other locations followed including at the Asoke and Phrong Phong Skytrain stops along the Sukhumvit line. We’ve walked by their Asoke location a number of times (always in a hurry to get somewhere) but recently took one of their blissful 2 hour packages and found this spa an oasis of serenity among all the hustle and bustle of this part of Bangkok. Their Asoke spa is located in about as urban a location as you will find, surrounded by a jungle of concrete near one of the busier intersections in all of Bangkok (Ratchadapisek and Sukhumvit roads). This is a prime location, mere steps from the Skytrain (exit #4 at Asoke) or a few minutes walk from the metro at the Sukhumvit stop. With such a high volume of traffic and noise outside you would think this might be a noisy spa, not so. The rooms are well insulated from sound and with the purring of the AC and soothing soft classical music in the background its easy to fall into a blissful state. 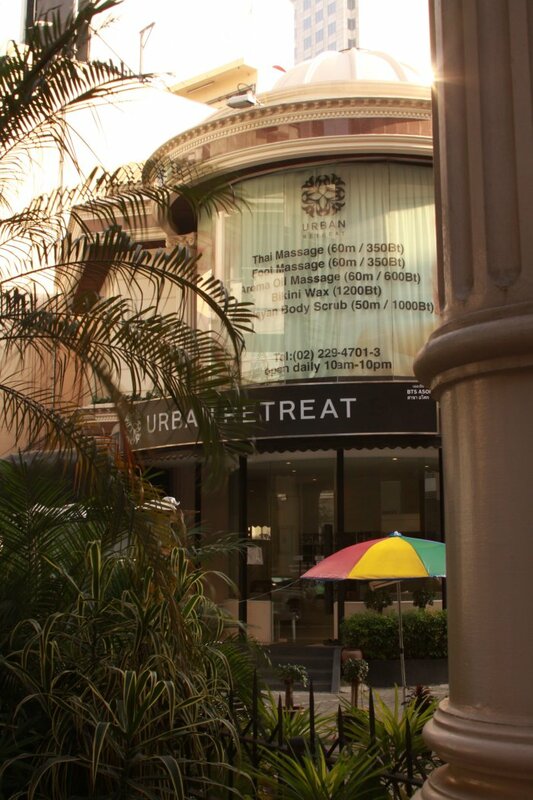 Urban Retreat offers a number of short and longer spa and massage options. Just arrived in town? Their “jet lag massage” will quickly put you to sleep. 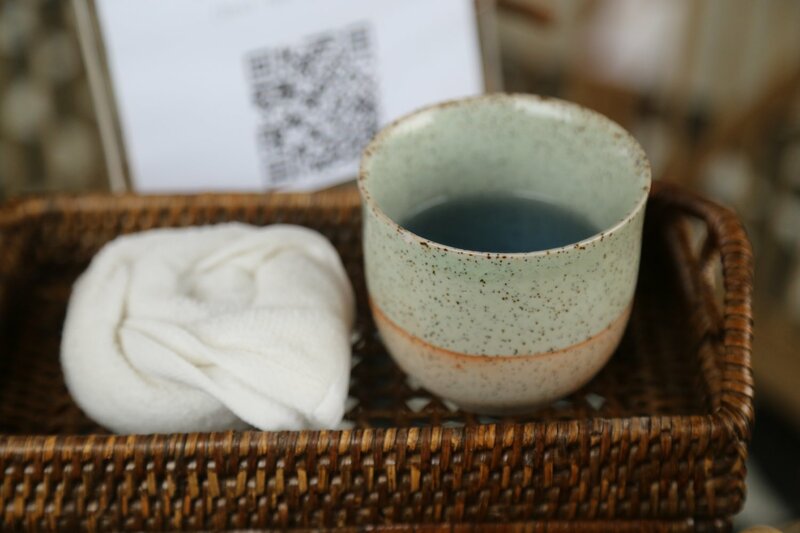 A perfect starter option is the 2 hour Oriental Spa treatment which includes a foot massage, a Thai body massage which ends with the warm comforting touch of the lemon grass scented herbal balls. Both their massages and spa treatments are priced reasonably. 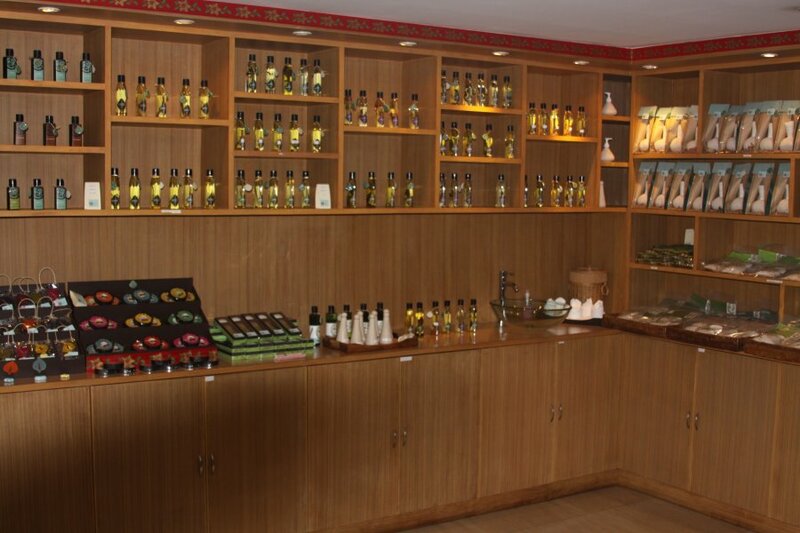 Urban Retreat also offers a number of their own oils, creams and related items for sale in the main lobby. Spas include more services than the basic massage businesses. A variety of massages are offered, including other perks such as bubble baths, steam rooms, possibly hot “rain showers”, ozone therapy and more. Most spas offer packages from 1 hour all the way up to 5 hours or more. 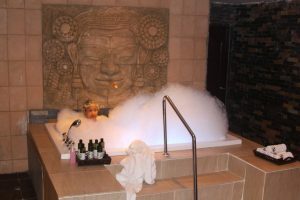 If you want pure pampering the spa experience is certainly the way to go! Some spas serve snacks or meals either during the spa or after. Couples spas are popular with one room devoted to a couple during the entire spa treatment. 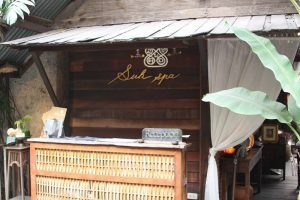 Spas tend to be typically higher priced than the massage businesses listed above, they provide top notch customer service and are typically very well decorated. 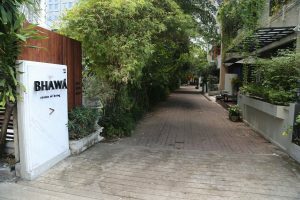 Ai Sa Waan is an intimate space for massage – conveniently located about a minute walk from the nearest skytrain stop, Chitlom. 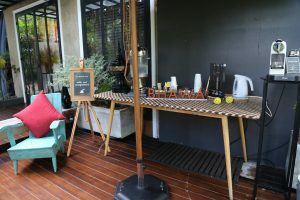 The Hungry Hunter cafe is on the corner and makes for a nice stop either before our after your massage – good drinks. Ai Sa Waan features a number of foot massage stations – and also private rooms for full body massages. The interior is simply yet nicely decorated creating a relaxing ambiance. During our visit the music was low enough not to be a distraction. 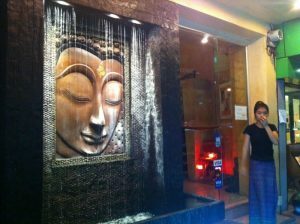 We enjoyed several massages here – a foot massage and a thai massage. The masseuse for the foot massage was obviously quite skilled and we would rate her massage significantly better then average. The Thai massage was done very well. 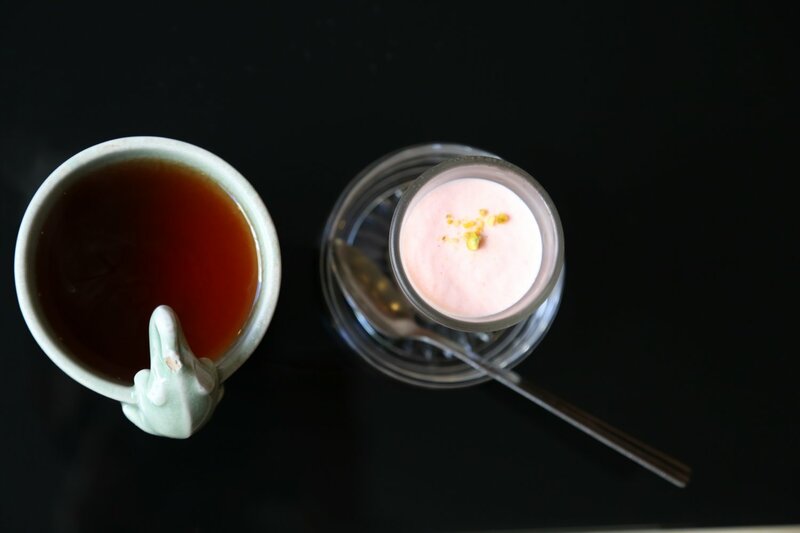 Warm tea is brought to you following your massage. 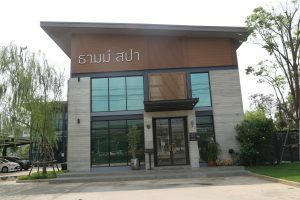 Baan Sa-Bai Thai Massage provides good massage at an affordable price if you are in the Khao San area. 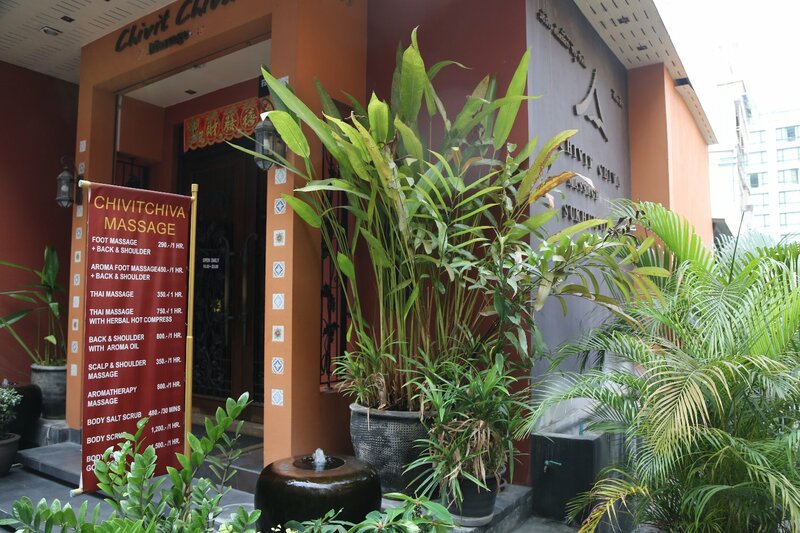 They are located at Soi Samsen 6 (small street just off of the main Samsen street) – near the Rajata Hotel. This is about a 15 minute walk from Khao San Road. 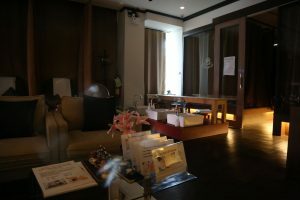 Golden Massage, Somerset Ekamai is located on the 2nd floor within a very short walk from Building A at the Somerset Ekamai (soi 55 – about a 8-10 minute walk from the Ekamai BTS Skytrain. Lets keep this wonderful little place our own secret, shall we?! 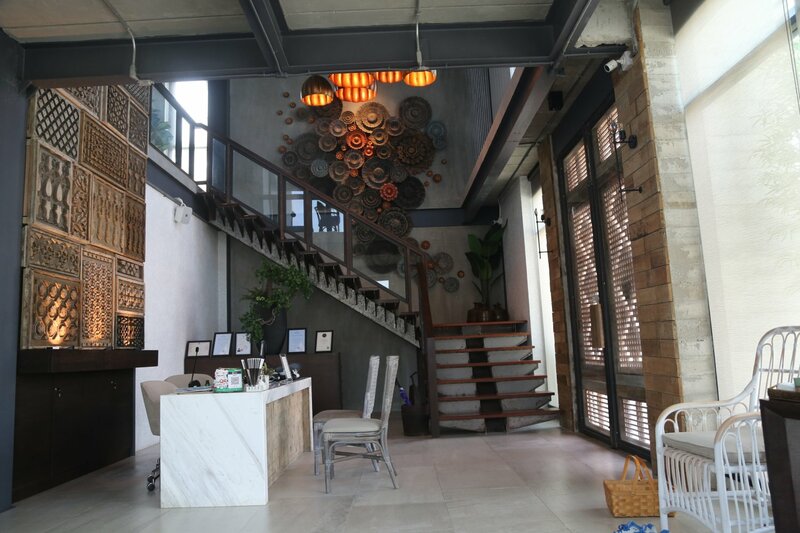 Clean, reasonably priced, well decorated and super quiet – but what really counts here is the expertise and training of the massage therapists. Gentle but firm, they are at the top of their game. 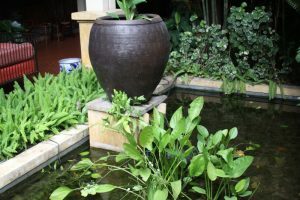 They offer numerous types of massages – we’ve have visited quite a few times and always come away refreshed and relaxed. And a plus is if you stay at the Somerset Ekamai, you don’t have to worry about seeking transportation back to some off-site hotel; you can simply stumble back to your room. On Nut, Sukhumvit 77 Area . 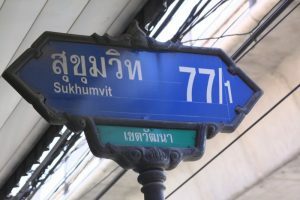 To reach this small soi take the Skytrain to On Nut (stop E9) on the Sukumvit Line. The following directions are assuming you are taking the BTS Skytrain: at the On Nut station, face the direction the train is traveling to reach this last stop on the line and then exit left – walking back down the street towards the way you came on the train. You will be walking almost under the Skytrain at this point and just a short distance down the street on your right side, look for the blue and white Sukhumvit 77/1 sign. Walk down this street you will see a plethora of *very* cheap massage businesses with all starting at around 200 Thai Baht per hour for a foot or Thai massage. Several of these businesses are run by the same owner and if there are no employees in one of the shops they will call the other shop. 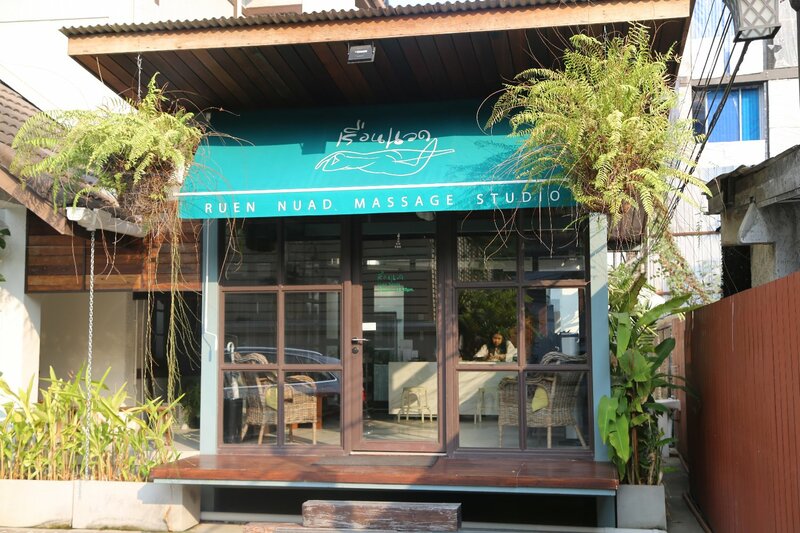 Ruen Nuad is one of our favorite small massage places in Bangkok – located at 42 Convent Rd in Silom Tel 02 632 2662-3. Ruen Nuad is located almost across from the big BNH Hospital – exit the SkyTrain stop at Sala Daeng. 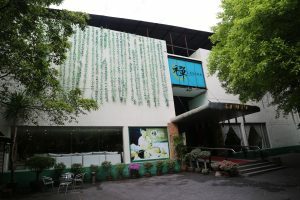 They are in a small building in the back of a small courtyard surrounded by the ever growing vertical skyline in this part of Bangkok. 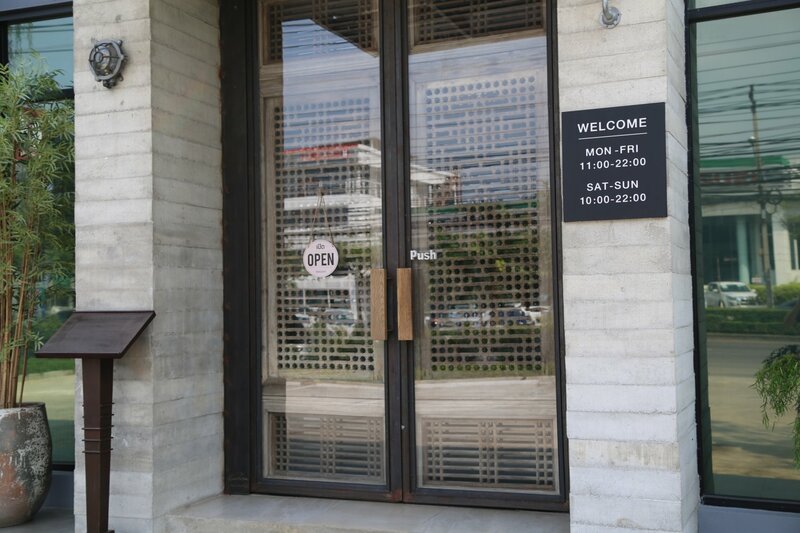 The Touch – is located at 11/2 Ruam Rudee (small side street). 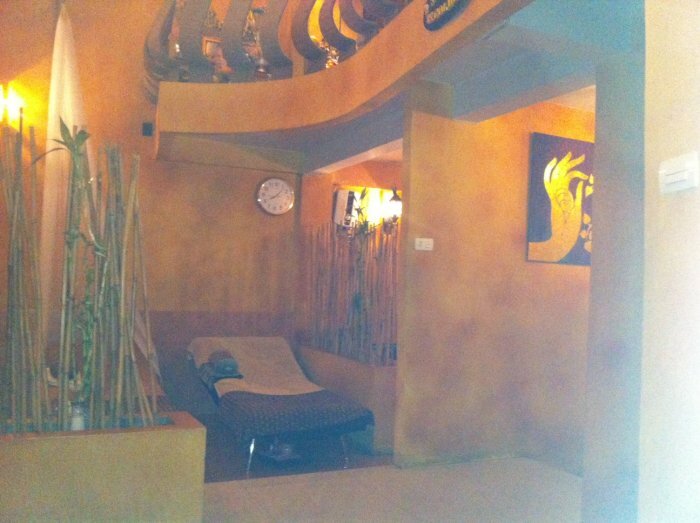 This small clean & quiet massage business has one main room with a number of chairs as well as smaller private rooms. The chairs do not recline all the way as at some massage businesses. 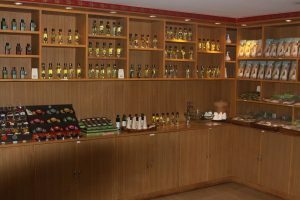 Their focus in the main room is on foot massage although they offer a variety of massages as well as packages that include discounts. The one massage we had here was extremely strong. 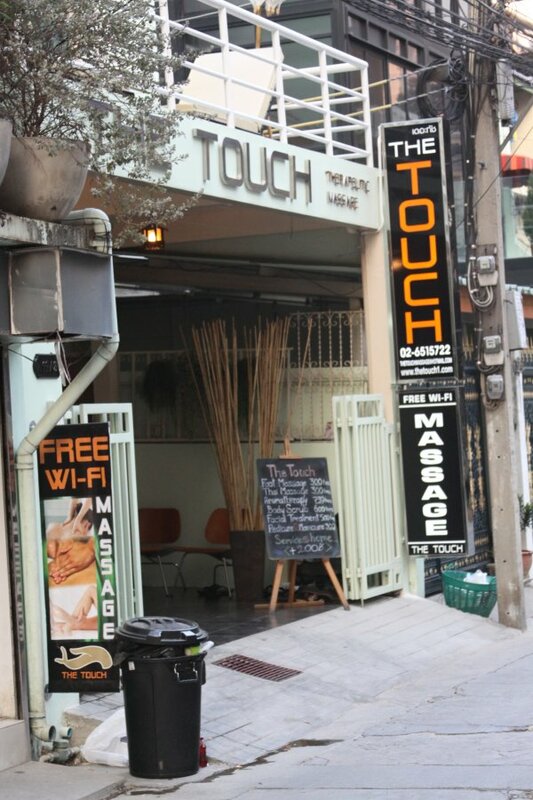 Free WiFi is available should you want to surf the net while having a foot massage (not sure why you would want to)! 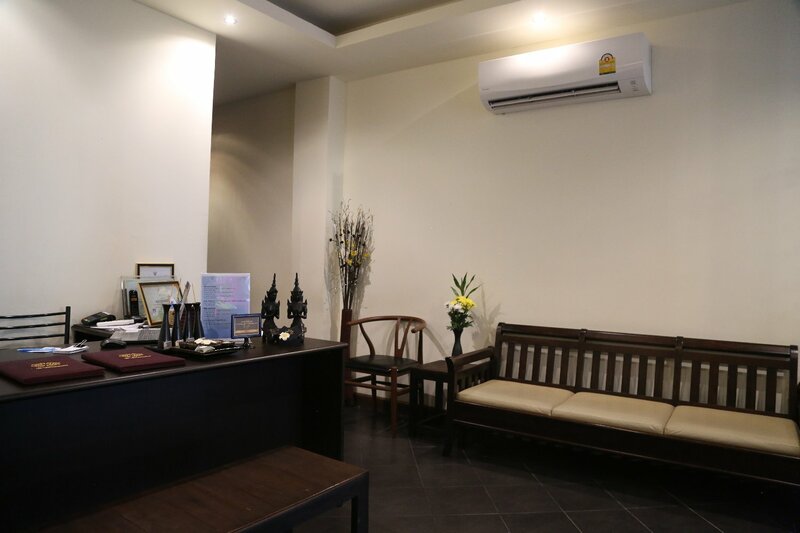 The atmosphere is relaxed, no appointment is needed for regular massages but you might want to make an appointment for a longer treatment. Thanomchai Aree Massage . 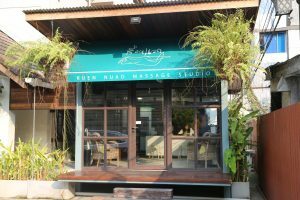 There are literally hundreds of cheap Thai massage businesses in Bangkok and many cater to tourists. 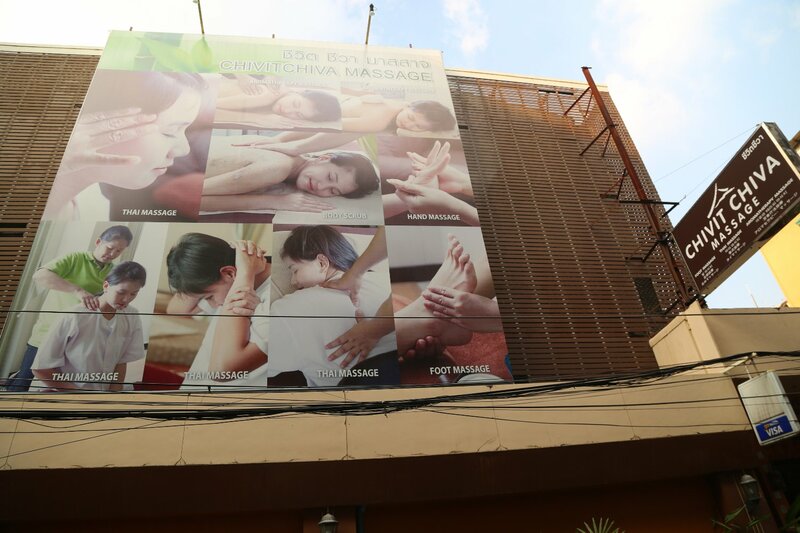 We’ve seen some blocks with 7 or 8 Thai massage places all lined up next to each other. 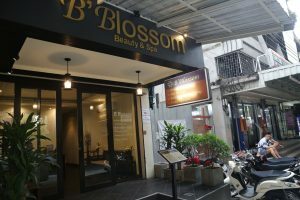 B’Blossom Beauty & Spa is conveniently located on Sukhumvit at the base of the Thong Lor Skytrain stop in between exit 1 and exit 3. 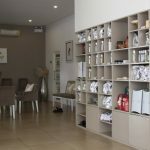 This tiny spa features a fairly non descript and sparsely decorated reception room – more of a low end spa, their focus is on massages but they also offer a number of body scrub and wrap options and beauty services. Walk-ins welcome unless all the masseuses are booked – they do also take appointments via their website. Very relaxing foot massages – 90 minutes passed by rather quickly during a recent visit. They care about their customers; upon leaving a questionnaire was given to try and gain customer satisfaction information. 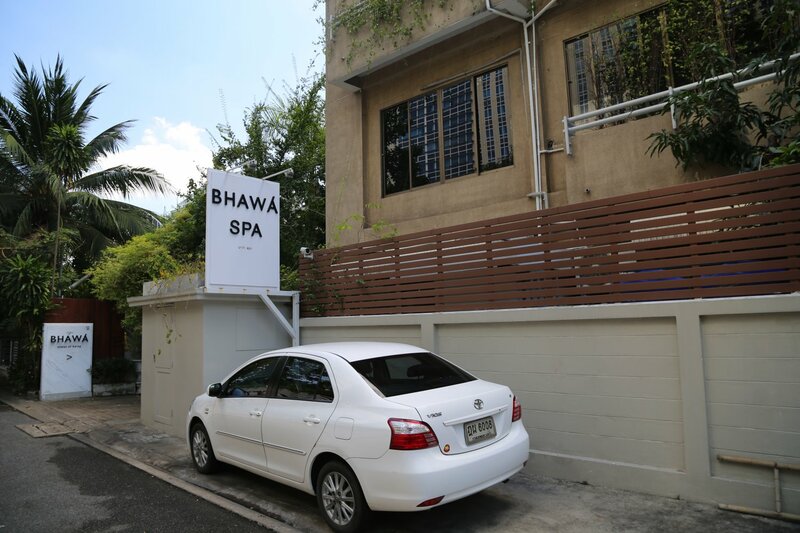 Bhawa Spa – this luxury spa is located down a small street with their own small quiet soi off of Wireless Road. 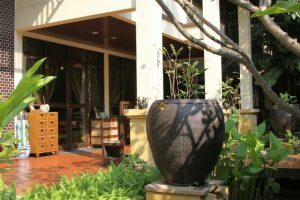 Attendants greet you immediately as you enter with a traditional Thai wai and then provide a refreshing cold towel and a hot drink while you settle into the very relaxing environment of their main waiting area. The focus here is on multi hour treatments with many of their services in the 3 to 4 hour range. Review coming soon. 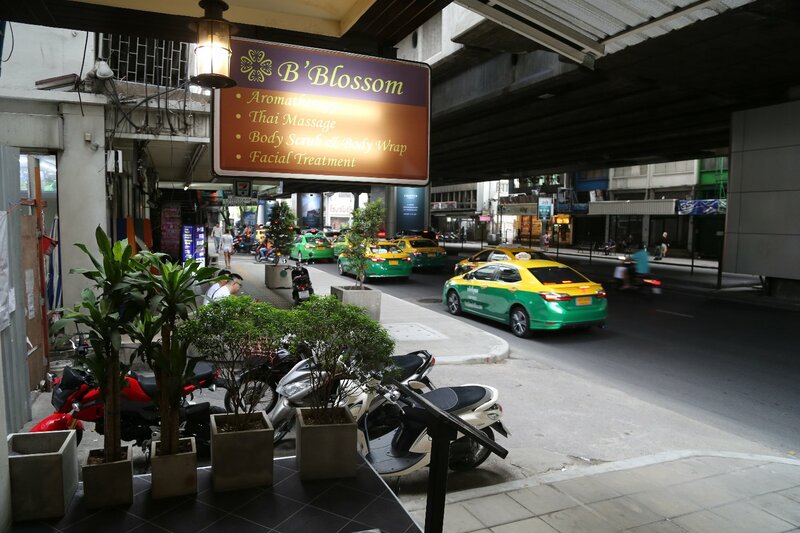 Location: Sukhumvit Skytrain Ploen Chit – exit #2 or #5. 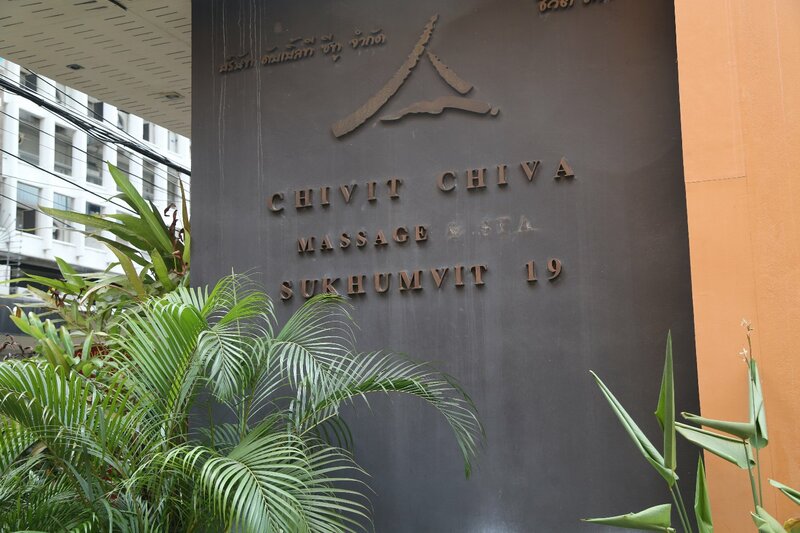 Chivit Chiva Thai Massage & Spa is a boutique spa located across from the Westin Hotel at 16/1-2 Sukhumvit Soi 19 – North Klongtoey. Look for the small church and several small massage businesses next door. 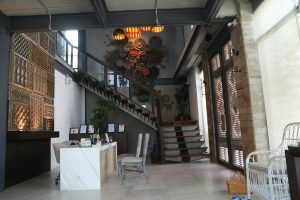 A number of the travel guides call this a “budget spa” but in actuality their prices are very similar to other area spas – there is an upstairs and downstairs – simple but elegantly decorated. This is a small spa. Their prices start at about 500 baht for a foot massage and go to about 2500 for the more involved longer massages. 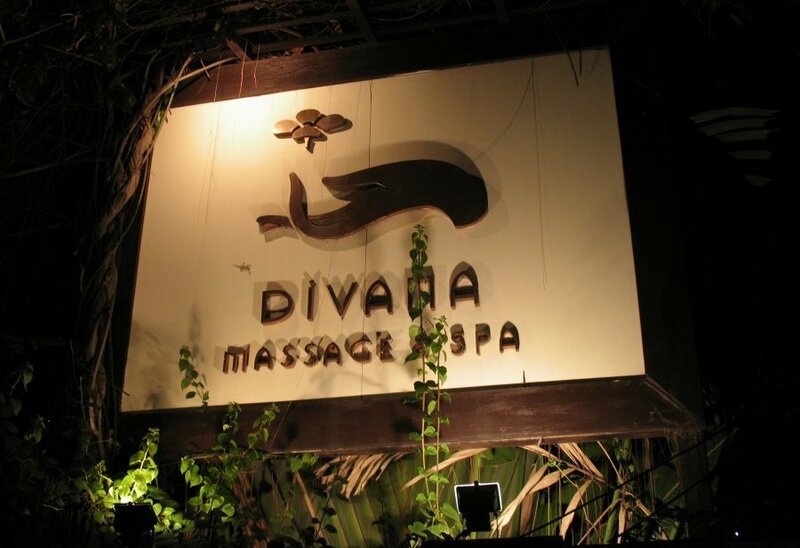 Divana Spa has several locations in Bangkok. The flagship business that we have visited several times is located at the end of the very small 7 Sukhumvit 25 road which is about a 10 minute walk from Skytrain Asoke station. This is a high-class spa run by a group of women flight attendants. These ladies have traveled the world and have tried many different spa and massage businesses and Divana Spa is a culmination of the best spa features from the spa’s visited by these ladies. Divana has wonderful indoor and outdoor ambiance and decorations. 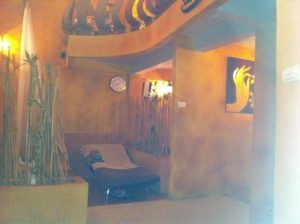 Alarge variety of massage and spa packages area offered. Lavana Spa is located at Sukhumvit Soi 12 – about a 2 minute walk in from the main Sukhumvit Road. This almost looks like a hotel building but there is no hotel here, the first floor entirely contains the spa. For an excellent value to quality of treatment ratio this is one of the better spas in this area. Sukhothai Spa & Wellness Center is located at 11 Sukhothai Road – Dusit. 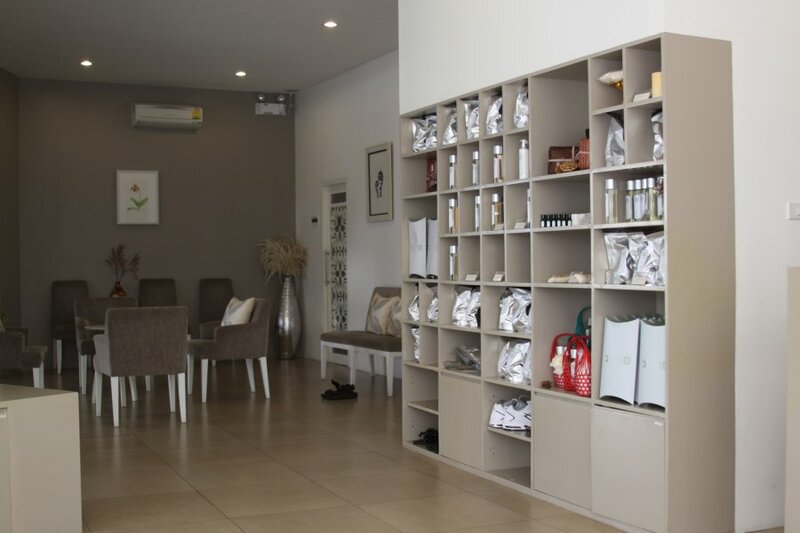 This is a more upscale full service day spa offering a variety of spa services and products. 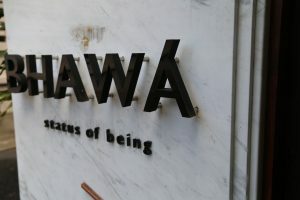 They offer the basic massages and then also a full suite of Spa Packages which combine massages with other services. 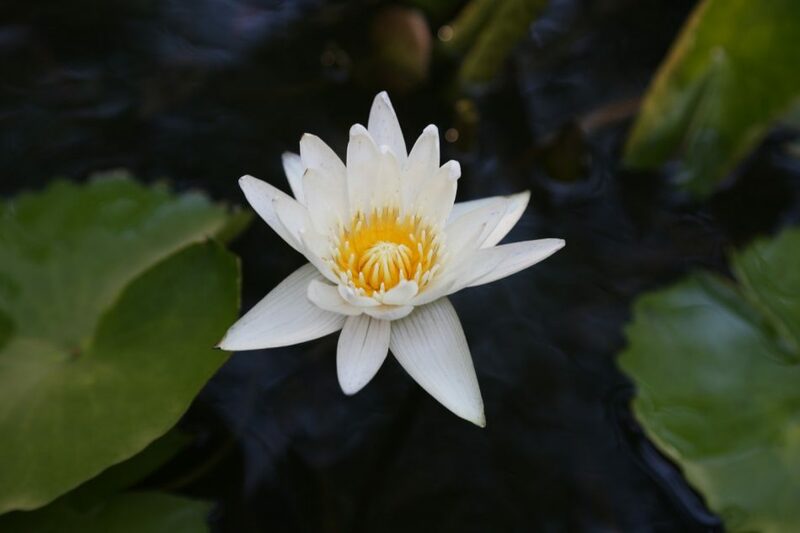 If you want complete relaxation choose from one or more of their Spa Packages! After treatments you are served healthy food and drink. They are open 7-days a week and can provide free transportation to and from your Bangkok hotel. Tyme Spa is located in the Latkrabang part of Bangkok – a short drive from Suvarnamphumi Airport. An ideal location if one needs to spend a night or two near the airport and has an hour or more. 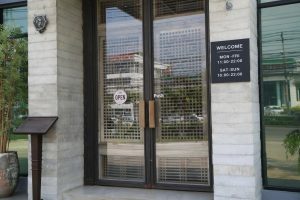 Opened in 2018, this modern and sizable space is very well decorated and inviting inside. Luxurious and a relaxing interior. 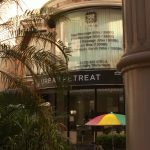 This spa often offers promotions and or specials for discounts on various services – and advertise at nearby restaurants and hotels.